If you’ve lived in Oregon for more than the past year, you’ve lived through a magnitude 6.0 earthquake and didn’t even know it. A group of university faculty, President Michael Gottfredson and Vice President for Research and Innovation Kimberly Espy met with elected officials to discuss earthquake research strengths at the University of Oregon and a possible investment by the U.S. Geological Survey to build out an earthquake early warning system. One participant was Amanda Thomas, a UO seismologist who studies “slow slip,” when the earth’s plates shift slowly – sometimes over days, months or years -- and are not felt as significant ground shaking events commonly known as “fast slip” earthquakes. This area of seismology began about a decade ago because of a discovery made from seismic monitoring systems in Japan, where activity occurs at a different depth in the earth. Understanding slow slip is important because it has implications for seismic hazard in the Pacific Northwest. The UO’s proximity to the Cascadia Subduction Zone and the seismic complexities of western North America has made the Department of Geological Sciences a hotbed of research activity for decades. The UO and the University of Washington currently provide seismic monitoring through the Pacific Northwest Seismic Network. As part of the work, UO faculty and others monitor and maintain a subset of sensors and stations statewide. The Pacific Northwest Seismic Network detects more than 1,400 earthquakes per year greater than magnitude 1.0 in Washington and Oregon, demonstrating the earthquake and volcanic risks of the area. The UO has recently collaborated with the University of Washington, University of California at Berkeley and Caltech on possible implementation of a public West Coast earthquake early warning system that would include areas near the San Andreas Fault in California and the Cascadia Subduction Zone in the Pacific Northwest. An earthquake early warning system can provide up to three to five minutes of warning to Portland and Seattle and two minutes in Eugene, reducing loss of life and damage to critical infrastructure. When the April 18 earthquake struck Mexico, citizens in the area benefited from an early warning system, demonstrated by a video shown during the meeting. “An early warning system could save lives and infrastructure,” said Congressman Peter DeFazio, D-Ore., ranking member of the U.S. House Natural Resources Committee, who attended today’s meeting. He has signed a letter with colleagues in support of a West Coast early warning system. In addition, state Rep. Nancy Nathanson, D-Eugene, who serves as vice chair of the state legislature’s budget committee also attended. The University of Washington and the University of California systems receive state support that the UO currently does not. 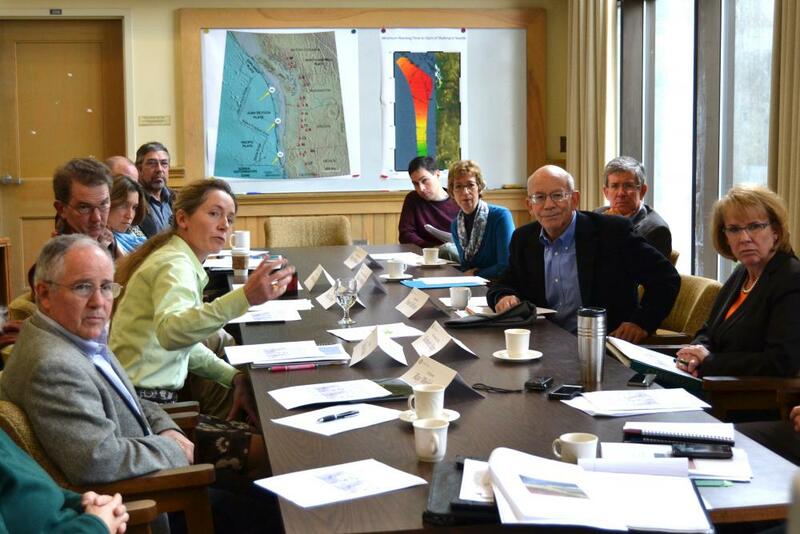 If federal and/or state resources are made available to establish an early warning system, the UO team can “learn more and make scientific progress while monitoring for an event to occur,” said Weldon.